The MaXx-D is our all new 4 LED cable free light unit that boasts just short of a blinding thousand lumen ouput on MaXx setting, in a simple Cable Free package. The new MaXx-2 range of lights (inc. the MaXx-D) all come in our new soft clam shell packaging. This allows you to protect your light wherever you take it with the lightweight, protective packaging. No more boring boxes! The “Piggyback” battery feature allows the burn times to be extended up to 96 hours at maximum! The most impressive burn time return on a Piggyback battery is a Joystick with a 3 cell “Piggyback” attached. Simply by plugging a “Piggyback” lithium-ion battery into the charger port and attaching the extra battery beneath your stem you can add burn times equivalent to the Joystick or Enduro MaXx by adding either a 1 or 3 cell battery. Our “Piggyback” batteries use new cell technology manufactured by the World leaders in Lithium Ion battery technology – Sanyo. 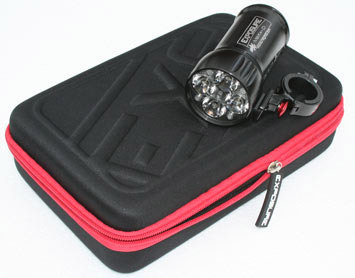 The idea of the Piggyback battery is to plug the battery into the light at the start of use. This will allow you to use the light on MaXx, Ride and High for a largely extended period of time. If the battery is plugged in with the light half charged, the Ride and Low modes will be avilable. The Piggyback batteries can be mounted either on your stem / handlebar or helmet – making your extra burn time flexible in all aspects! 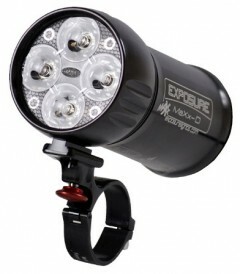 The Exposure MaXx has always been a neat idea, but the new Daddy puts the niggles right in this top trail light. The four-LED head unit gives a great spread and decent depth, so accurate aiming isn’t important any more. Its Smart Port adds a remote switch option, so you don’t have to mess with the awkward double-click switch on the back. This leaves plenty of power for pushing the pace on technical trails with a three-hour run time (plus there’s the ‘ride’ and ‘low’ settings and optional ‘piggyback’ battery). The single-can package also keeps weight low and ease of fitting high. It can be a knee-knocker on small frames, won’t mount on a helmet and its reliability is unproven, but we really like it so far.